Argentine football sensation Lionel Messi is going through a rough patch with his recovery. Barcelona FC club doctors erred when they predicted his recovery time. It seems now that since Messi has not recovered fully he will miss playing in the first XI of the upcoming Clasico. Lionel Messi, the sensational striker, is having difficulties with his recovery schedule and is rather anxious about the slow progress of his knee. The last two weeks have not gone well as it was predicted, and this is frustrating Messi. 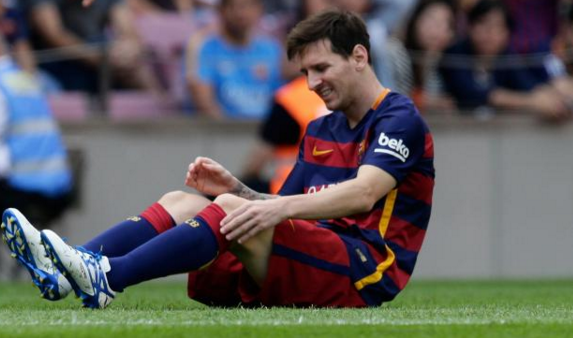 Messi has been on crutches longer than expected as he is not confident with his left knee. More so, when he applies pressure to it, he is suffering from excruciating pain, and this has delayed his recovery by another week. Lionel Messi is a renowned football player who has bagged several sports awards, including capturing the coveted Ballon d’Or prize four times. Why still out of active play due to an injury, Messi has been trying to run, but every time he runs, the pain slows him further. Now given club doctor's' prediction that he needs a further 21 days to tone up, the pain is further making it hard for Messi to recover in the set time. It now seems like a pipe dream that Lionel Messi will feature in the Blaugrana Colours. Punters now agree that Lionel’s absence will factor a lot. Given that he has contributed 21 goals and produced 11 assists in the 27 Clasicos he has featured in since 2004. With Messi in their fold, the Catalans have managed to bag in 10 matches, drawn three games and lost only five matches since 2004. As difficult as it is for the Catalan club to go on with the league without Lionel Messi, it would take a miracle for the Argentine to be remotely close to feature in the game against Real Madrid. Now pundits agree that it's time FC Barcelona prioritized Messi’s health as much as he is their most valuable player. Fans worldwide will be disappointed to watch a Clasico that Lionel Messi isn’t part of, and rival Cristiano Ronaldo, the club has a responsibility to make sure that Messi recovers. In the past, Barcelona has been guilty of hastening the star’s recovery and sending him back into play. Their haste in the past has led to Messi performing poorly on the pitch. Back in 2013, Lionel Messi suffered a hamstring strain as Barca played Paris Saint-Germain during the quarterfinals. Despite not having recovered fully, Messi was included in the starting XI during the next meet. He performed exemplary in the match, however, since he had not recovered fully, Lionel ended up suffering from four muscular injuries in eight months. The rest of the season saw him struggle with recovery. As much as the upcoming Clasico is the most crucial game of FC Barcelona’s game season to date, the club needs to think before featuring the injured Argentine. Moreover, the league winner will be decided perhaps by next year in May, and that should give Lionel Messi enough room to recover. As much as a victory in Madrid would be a morale booster for the remaining matches, there are only three points out of 114 points that are up for grabs on November 21st. So given this trajectory, it would be foolhardy to rush Lionel Messi’s recovery so that he features in the game! Tony Samboras is a freelance football Columnist who contributes content for a variety of online sports columns. To see more about what is going on in the world of European soccer check out what happened during Matchday 4 of the UEFA Champions League.